Perfect for your Ceremony, Drinks Reception and your Wedding Breakfast, we'll provide you with professional string players, effortlessly covering all musical styles to match the feeling of your day. For ultimate romantic and intimate musical moments, our unique string groups will wow your guests and give you wonderful memories. Having organised music and performed for hundreds of weddings in London and the UK, Blue Topaz Strings have the experience and reliability to ensure that your wedding day string music is beautiful and right on cue. Wedding venues where we have been engaged include Nonsuch Mansion, The Dorchester, Grosvenor House Hotel, Brocket Hall, the Mandarin Oriental, Blenheim Palace, Kensington Palace, Banqueting House, Lancaster House, Addington Palace and Belvoir Castle. Whether you would prefer our Exclusive String Trio or String Quintet, our Blue Topaz String Quartet with bass, our Traditional String Quartet, String Duo, Solo Violin or Cello, Harp, Guitar, or full String Orchestra we understand perfectly what will work and when. With a long list of very happy wedding couples and clients, you'll find testimonials on the site. You can be assured that our dedication to your day and our own standards of musical excellence and personal attention, will give you a day to remember. We welcome all wedding music enquiries, from those clients who are looking for a simple but beautiful soundtrack, to even the most detailed and specific musical requests. We are often recommended to particularly discerning clients by other wedding music suppliers for more complex bookings that require precise consideration. For those clients who prefer a more personal touch, we offer a Premium Wedding Service which includes a face to face meeting to discuss all the musical aspects of your day. We can consider the timetable of your day together and decide on the perfect musical accompaniment for each section. This service also includes a bespoke musical string arrangement of your choice. Please enquire for more details and to book. When might we perform during your wedding day? From our experience, music at the following moments during your wedding day can work really well, however we can play at any point you choose so please contact us to discuss your day. Depending on the structure of your wedding celebration, this can be from as little as 15 minutes as guests are seated, to full arrival drinks of 1.5 hours. Our musicians will play suitable arrival music to welcome and settle your guests before your grand arrival! You may like us to play for the Processional, as the Bride walks down the aisle. Depending on the string line up that you choose there are many beautiful pieces that we can play for this including the all time favourite, Pachelbel’s Canon, the very traditional ‘Bridal Chorus’ / ‘Here Comes The Bride’ by Richard Wagner or something more current - perhaps a special arrangement of your favourite pop song? Please contact us for a more comprehensive suggested list of suitable pieces. The signing of the register can be a lovely moment for music for your guests to enjoy whilst you complete the paperwork. If you will be booking our traditional String Quartet perhaps you might choose a slow movement from a Mozart Divertimento or for a solo violin maybe Meditation by Massenet. Please contact us for a full list of suggestions for your chosen string ensemble. The Recessional as the Bride and Groom exit the wedding ceremony can be accompanied by a grand musical send off! Choices for our Feature String Trio or Quintet could include ’ La Rejouissance’ by Handel ‘All You Need Is Love’ by The Beatles or ‘Happy’ by Pharrel Williams. Alternatively our String Duo might perform ‘It Had To Be You’. For religious ceremonies perhaps you would like us to provide the musical accompaniment for any hymns that you have chosen? This might be particularly important if you are not booking an organist. You could also choose to have a piece performed by our musicians in place of a reading. This could work well if you have a particular piece that holds significance to you as a couple. Our talented musicians are happy to work with you to provide unique string arrangements for any piece as part of our bespoke arrangement service. Every drinks reception is brought to life with first class live music and Blue Topaz Strings ensembles have the perfect repertoire to get everyone in to the swing of the day. Our Exclusive String Trio and Quintet have a vast jazz and pop song repertoire that has proven very popular for wedding drinks receptions. The slap bass technique brings excitement to many an up beat track from Fly Me To The Moon to Marry Me by Bruno Mars, not to mention some Michael Jackson and Beyonce numbers! For classical lovers we also have a comprehensive list of more traditional pieces including music by Mozart, Elgar and numerous opera favourites. Depending on your venue the Exclusive String Trio is perfect for numbers from 20-70 without amplification and from 70-300 guests with hire of our PA system to include instrument microphones, speakers and our string specialist sound engineer to oversee. The Exclusive String Quintet is perfect if your wedding will have large numbers or to make a strong musical and visual statement. (From 50-80 guests without PA and up to 300 guests with hire of our amplification and engineer) Please contact us with your requirements. The Blue Topaz String Quartet (2 violins, cello and bass) offers the feature trio and quintet repertoire and is perfect for cello lovers who prefer our exclusive group repertoire. Our Traditional String Quartet can play all time classics such as Bach’s Brandenburg Concerto Number 3 or Divertimento in D. Also some more contemporary numbers including Chris de Burgh’s Lady In Red or even Queen’s Bohemian Rhapsody! Subject to the venue, the acoustic string quartets work beautifully for weddings with 20-70 guests and for 70-300 guests with hire of our amplification and string specialist sound engineer to oversee. Please contact us with details of your venue and requirements for an accurate quote. With epic classical numbers by Bach, Vivaldi, Handel and Saint-Saens plus lilting jazz standards and energising pop numbers the Violin/Cello Duo offers a virtuosic standard and an entertaining mix of styles for smaller numbers (6-50 guests) or more modest budgets. The duo can be amplified subject to availability, making it suitable for larger events. Our solo violinists and cellists can be hired to perform with or without backing tracks offering a mix of musical styles. For unaccompanied bookings we recommend guest numbers of 6-30 and accompanied by backing tracks up to 100 guests. Suitable for smaller budgets. Our harpists and guitarists provide a beautiful atmosphere for smaller and more intimate receptions for up to around 40 guests. They can also be booked for larger guest numbers in conjunction with another group, perhaps to play in the entrance hall whilst our String Trio or Quartet plays in the main room. The Blue Topaz String Orchestra is the ultimate wedding drinks reception welcome. With a dazzling array of beautiful string instruments played by beautifully presented musicians, your guests will have their breath taken away! With a repertoire that mirrors many of the uniquely arranged Exclusive Trio and Quintet numbers, the Blue Topaz String Orchestra shows off our bespoke and signature style at its best. Suitable for large and high end events from 70 guests plus. Amplification and our string specialist engineer can be hired to further boost the sound as required. Perhaps you might like to hire our musicians to perform live music during your wedding breakfast? With repertoire that is suited to accompanying dinner conversation and played at an appropriate volume, Blue Topaz Strings can bring the perfect ambience to your meal. Our musicians provide a beautiful musical accompaniment without overpowering conversation between your wedding guests and are well suited to Wedding Breakfast entertainment. The calibre and standard of our string arrangements are second to none. This is evident from our Trio and Quintet Exclusive Group repertoire, which is entirely arranged by us and is ever evolving. Due to our wide range of skills and proven capability, we are able to expertly and perfectly capture the essence of your favourite song or piece for any of our musical ensembles. We can arrange your favourite piece for any part of the ceremony or your day. Perhaps you might like us to arrange a string version of your chosen First Dance piece? Please contact us with details of your favourite song. You can also visit the First Dance section below for more details on how we can help you transform this moment in to a truly romantic and memorable experience. The First Dance has long been a tradition at weddings and historically was performed by the guest of honour such as royalty, at social gatherings. They would lead the dancing before everyone else would join in. As guests of honour at their own wedding, the bride and groom perform the First Dance. We can help transform this into a beautiful, personal and lasting memory for you and your guests. We can even capture it on film for people who may not be able to attend your celebration in person and as a wonderful memento of your day. Chloe contacted Blue Topaz Strings to engage the Exclusive String Trio play for her wedding drinks reception. She also mentioned that she was thinking about having a piece especially arranged for her First Dance and might we be able to help? The answer was yes! Chloe also asked us to create a slow waltz set which would follow her First Dance, so that all of her guests could then enjoy some couples dancing. For this we included a mix of traditional and more modern day waltzes such as ‘You Make Me Feel’ by Carol King, Plaisir d’Amour, a French love song by Martini and Come Away With Me by Norah Jones. 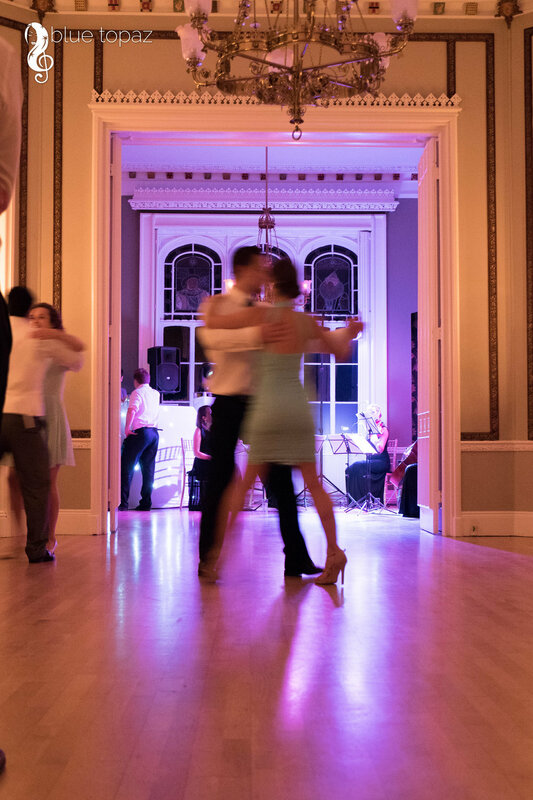 For the First Dance and Slow Waltz set we used amplification with our string specialist sound engineer, in order that all the guests could enjoy our music and so that the sound was boosted to an appropriate level for the number of guests and room size. Our complementary lighting gave the performance area extra ambience. I am so grateful for all of the effort and commitment you and the rest of Blue Topaz put in to making the music for Dan and my wedding so special. Your performances on the day were beautiful (lots of guests commented excitedly on the contemporary songs you were playing at the cocktail reception!) and I am in love with your arrangement of our first dance song. I wasn’t sure whether to spend the money getting it recorded but I am so glad we did! Thank you for your commitment and focus from beginning to end on understanding what I wanted and bringing it to life. I’ve spent hours practising to this song and the crescendos in the music still get me every time! If you would like help or suggestions of suitable venues for your wedding celebration we would be delighted to offer our advice and recommendations. Please enquire for more information or to book an appointment with us. I just wanted to thank you all for helping to make Katy and Luke’s wedding such a memorable occasion last Friday at Nonsuch mansion everyone thoroughly enjoyed themselves and thought that the music was lovely.